We started visiting Guatemala early in 1980. Our teens went on several mission trips to Belize and would spend a day in Guatemala. After several years, our adults visited Belize and also spent a day in Guatemala. God used those brief bus excursions to set in motion an unusual and extensive involvement with the Northern Peten District of Guatemala. Guatemala I In the late 1980’s we began a short-term summer focused ministry into the Peten. We sent approximately 50 different teams into the Peten for a week each of ambitious village ministry. We conducted medical clinics, VBS classes in the public schools, Hut-to-Hut evangelistic ministry, nightly evangelistic tent meetings, village video outreaches and other acts of community service. We visited approximately 45 different villages during the 7 years of these outreaches. We came to love and be loved by the people of the Peten. They were wonderful days and we saw much fruit. As we came to be fairly knowledgeable of the Peten, we realized their need for the Living Water of the gospel of Jesus Christ as well as clean drinking water. These deep realizations gave rise to an extensive second phase of our Peten outreaches. 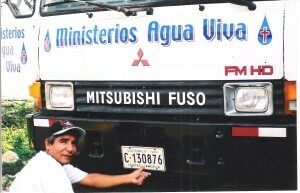 Guatemala II (Watch Above Video Report) Ministerios Agua Viva was birthed in the late 1990’s. One of our beloved ministry helpers in Belize suggested we provide rain-water collection gear and 1000 gallon water storage tanks for as many families and villages as possible. Our desire was to provide an uninterrupted supply of clean drinking water to as many needy remote villages and families as we possibly can. We purchased a diesel flat-bed truck and outfitted it with a 2000 gallon water hauling tank. A tank, collection guttering and galvanized roofing tin for one family costs in excess of $650.00/home. We have now placed over 300 of these units since we started. We have supplied the funds to build 4 churches and other buildings as well as funded several local pastors in the remote villages. We paid the full-time salary of our lead-contact man who oversaw the project in the Peten as well as maintained the flat-bed truck for hauling purposes. We have received the generous financial help of others whom God has influenced to give. We placed tanks in small remote villages and isolated farm families.